Mitch Cahn, the President of Unionwear, and the Chairman of the Newark Workforce Development Board, has won the Raymond Hopp Lifetime Achievement Award for Excellence in Manufacturing. The announcement was made official at National Manufacturing Day. The fifth annual event was held on Friday, October 7, 2016. This celebration aims to improve public perception of the manufacturing industry’s economic value and to expand knowledge of manufacturing careers. The Excellence in Manufacturing Award was established in memory of the president of HK Metalcraft, Raymond Hopp. Mr. Hopp was extremely dedicated to the New Jersey manufacturing community’s workforce development and was considered a strong advocate for their cause. Have been involved in the New Jersey manufacturing community for a minimum of 20 years. Back in 1992, Mitch Cahn started the New Jersey Headwear Corporation, which would one day become Unionwear. He landed a contract with Ralph Lauren for ball caps and had 15 individuals doing all of the sewing. Now, with 175 employees, Mr. Cahn’s Unionwear is responsible for nationwide promotional gear used in political campaigns and much more. Additionally, he is a principal textile supplier to the federal and state governments, post office, homeland security, and the military. As president of Unionwear, and in years before that, Mr. Cahn has been publicly recognized as a passionate individual who works relentlessly to do as much as possible within his platform and position. A recommendation specifically for this award credited Mitch with not only meeting but exceeding the challenging expectations and requirements to win the Raymond Hopp Award for Excellence. Mr. Cahn’s commitment to fellow manufacturers and education is evident; he participates in numerous events and organizations, including but not limited to Grants and Incentive Programs for Urban Manufacturers; Cloud, Mobile, Manufacturing Technology on the Shop Floor; Designing for Manufacturing; Worker Rights Compliance in Procurement; Continuous Improvement and Lean Manufacturing, marketing “Made in USA”; and more. Numerous fellow entrepreneurs and friends celebrated Mr. Cahn’s achievement. Cohn Reznick (of Cohn Reznick LLP) offered an official pat on the back via Twitter: “Congratulations Mitch Cahn of [Unionwear USA] on receiving the Raymond Hopp Award for Excellence.” Cohn Reznick LLC is one of the top advisory, tax, and accounting firms in the United States. Thanks to devoted entrepreneurs such as Mitch Cahn and his devotion to manufacturing high-quality products, consumers have a viable and laudable alternative to cheap imports. At a time when pride in America and demand for “Made in USA” products are increasing, it’s surprising how many companies still insist on outsourcing their manufacturing internationally. Yet, despite the reduced costs that these companies will likely negotiate, their prices either stay the same or continue to rise. This does not bode well for the American public, any way you look at it. But Unionwear refuses to give in to overseas outsourcing and price gouging. Perhaps that is why Unionwear, a company that features union-made products and whose slogan is “Made Right Here” is still in business after 25 years. In 1992, Unionwear President Mitch Cahn started the New Jersey Headwear Corporation as a contractor for fashion designers in the a new product category: the fashion baseball cap. In those early days, the company had a mere six individuals doing all the sewing and assembly. Ball cap contracts with Ralph Lauren’s Polo, Barneys New York, Gant, and Izod helped put the company on the map and increased staff numbers to 35 machine operators. the company was churning out hundreds of thousands of hats per year by 1997. The name Unionwear came about after the textile business shifted toward Asian production in 1998. Mr. Cahn realized that his company was one of only a few still manufacturing union-label baseball caps within the United States. While Craft Hats, King Louis, and West Penn were moving their production overseas and closing their United States manufacturing facilities’ doors, Unionwear would not only stay put but also expand. Fast-forward to today, and one cannot help but notice how the company has stayed true to itsroots, keeping production within our borders and prices affordable. His headwear company has now branched into other product lines and employees 175 proud union workers. Unionwear has manufactured presidential campaign wear and other political logo products. This Garden State factory has been the go-to manufacturer when it comes to Made in America gear for Sanders, Cruz, Clinton, Bush, McCain and countless other candidates. Unionwear has consistently produced customized orders to suit the needs of their clientele. Presently, in addition to baseball caps of varying styles, Unionwear deals in knit scarves and caps, winter gear, and bags of all shapes, sizes, and designs. And just recently, Unionwear acquired the assets and personnel of DLX Industries, expanding their product catalog to include portfolios, binders, and other business accessories. Unionwear continues to win awards for their meaningfully contributions to society; they care deeply for the public that put them where they are today. And although employee salaries have gone up, and costs are certainly not going down, Unionwear still manages to provide affordable, high-quality, American-made products to their customers. Please join us in congratulating Unionwear for a job well done. They’re keeping jobs where they belong—right here in the United States of America. Happy 25th anniversary, Unionwear! Unionwear and the Louise A. Spencer School in Newark deserve sincere congratulations for winning this year’s video competition, What’s So Cool About Manufacturing? This award, given annually, stimulates the imagination of students, inviting them to pursue careers in manufacturing. Its secondary aim is to boost the profiles of New Jersey’s factories. A range of awards are bestowed by judges in each regional contest, and online votes for the Viewers’ Choice Award are tabulated at WhatsSoCool.org. In 2013, Allentown Pennsylvania’s Manufacturer’s Research Center (MRC) created the What’s So Cool About Manufacturing? contest, and now hundreds of schools in the region participate. Teams of teachers, coaches, and students receive professional guidance, software, and camera equipment as they learn to edit, record, and script their video stories. The objective? To change students’ perceptions of manufacturing careers. The winning video, which runs two minutes and 30 seconds, begins with several schoolgirls admiring a shirt worn by one of them and discussing where it came from. Realizing that anything purchased from “the mall” originates from somewhere else, they ponder what goes into the manufacturing process. Enter Unionwear and Mitch Cahn, President. He discusses his manufacturing company and how it works. The video also features Agi Tamrakar, a recent graduate of NJIT who elaborates on his education and internship with Unionwear. Upon completing his masters, he accepted a permanent, full-time position at Unionwear. Mr. Tamrakar also explores the many facets of the manufacturing industry. The video concludes with the original schoolchildren reiterating how cool manufacturing is. The video is informative and enjoyable, and the performance given by the schoolchildren is admirable. Dream It, Do It promotes advanced careers in manufacturing for educators, adult family members, and students. Dream It, Do It is a companion of the What So Cool About Manufacturing? video contest and provides career resources. Additionally, Dream It, Do It selects and manages a dream team of dynamic manufacturing professionals. This team makes presentations at community locations and schools for students and teachers. 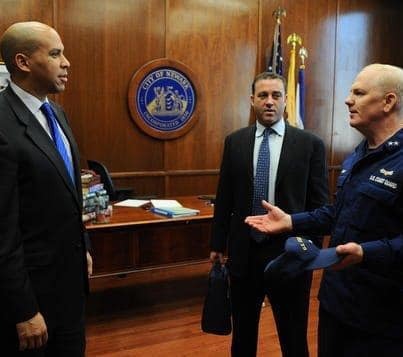 Coast Guard and the Department of Homeland Security recognized Newark’s Unionwear for delivering 50,000 units of newly developed uniform headwear in under 90 days.